Sodium Pentothal Sunday is a variety, talk show featuring guests who share experiences, thoughts and ideas on the topics of Gender, sexuality, politics and much more. Everyone is welcome, regardless of sexual orientation or gender identity. 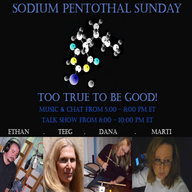 Sodium Pentothal Sunday - LIVE!